Time to update your address book as Aphaia / One Stitch More has a new home over at aphaia.org ! If you’ve purchased one of my patterns previously, you’ll see this popping up over the next few weeks. If you are on twitter – you’ve already had a little sneak peek. I’ve been thinking about developing a logo for my patterns and this blog/website for a while and have been sketching possibilities to ascertain their potential. The column capital was one I kept returning to. The ancient world has been and continues to be a massive part of my life – it seemed a shame not to acknowledge this. Just a quick picture update, which isn’t …um… all that different to my Ravellenics post. These are the 3 FOs which I have pictures of. There is a Windschief (the second I have knitted this year), for J again, this time in black. Which I don’t have a picture of him wearing. Actually I don’t have a picture of the hat, let alone anything else. As I mentioned in a post (some time ago… *ahem*), for the first time I had a go at the Ravellenics. I entered three pieces – two WIPs (Asperous and Follow ‘My’ Arrow) and a pair of socks (Fruit Salad Socks). More importantly I actually managed to finish them within the period! I got a little burned out on mystery knit-a-longs last year and and decided that I wouldn’t be doing that again. 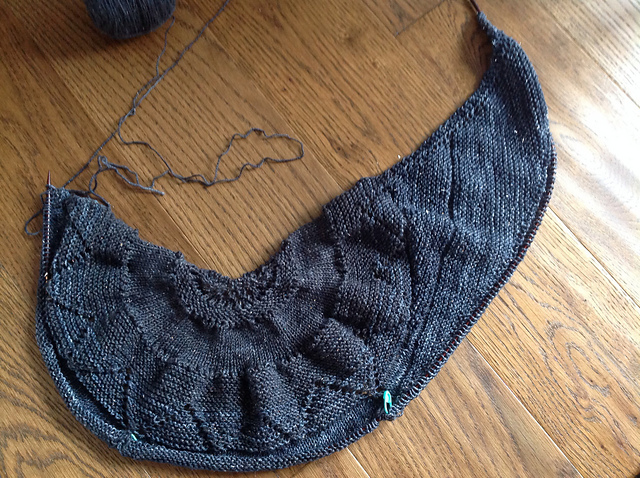 However, when Ysolda announced the Follow Your Arrow MKAL earlier this year I was intrigued. 32 different shawl combinations… this was appealing. The idea that I could have the encouragement a KAL usually provides (weekly clues mean I don’t want to get left behind!) while having more say in the finished item were the main reasons for this particular KALs appeal. Since I am trying to avoid excess yarn purchases I was very keen on using something from my stash. I wasn’t keen on the idea of a two colour shawl on my initial attempt at the pattern – I don’t mind multi-coloured shawls, but I like to see in advance how the colours sit together in the pattern before committing. 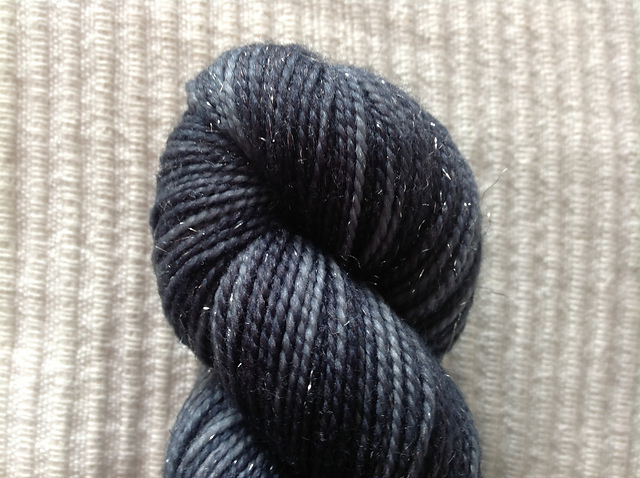 Luckily I had two difference skeins of The Yarn Yard Moondance – 100g of a dark gray shade and 50g from the Small Skein Society’s ‘Hadfield’ colourway (pictures below – the dark gray is first, then the Hadfield). The two sat together very well, the Hadfield was a little lighter and more variegated but alternating the skeins solved any colour issues. In week 1 I opted for the semi-circular B option to start, I liked the idea of the triangular A but I much prefer semi-circular shawls as a rule. Week 2 saw the shawl take a jump to the side with some asymmetric short row shaping (option B once more). Weeks 3-5 saw the lace arrive with options A, B and A. I loved the knit on editing option in week 5’s B clue but 1. I tried a few times to knit this on and failed on every attempt, and 2. When I did manage to get a bit of it done, it didn’t sit well with the rest of the shawl – so A it was! I love the finished shape, it is perfect for coiling around the neck, the asymmetric shaping allows it to sit nicely with little risk of it falling off. I am tempted to knit another, starting with A this time but I need to have a flick through my stash to see what would work for that.